For me lunch is the trickiest meal of the day. 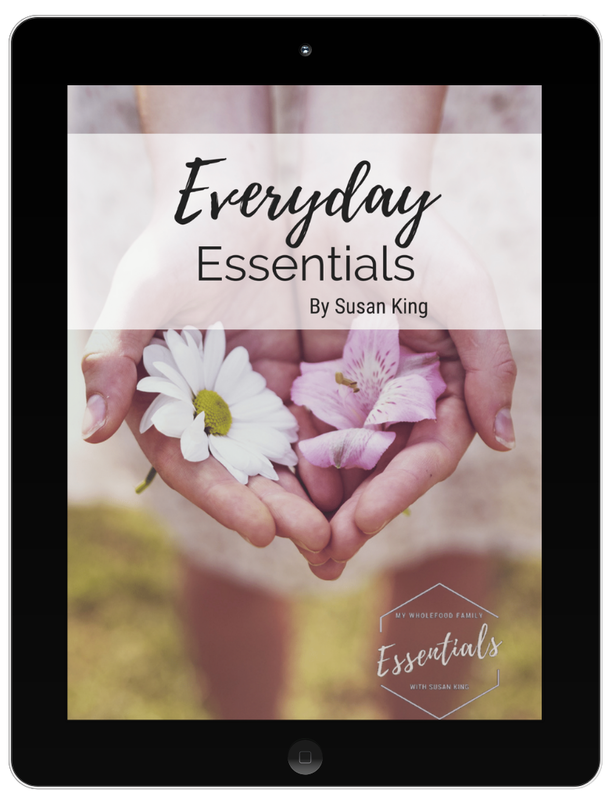 As I work from home I generally have lots of time to think about and plan meals. Mostly I try to make enough dinner so there are leftovers to eat the next day. But when that doesn't happen I spend ages gazing into the fridge and pantry to find something yummy that won't take ages to make. Lately I've resorted to noodles or baked beans on toast and that just won't do! Remove the crusts from the bread and spread one side of each evenly with butter (I actually left the crusts on this time because we had really yummy bread). Slice into quarters or whatever shape will work best for your baking dish. 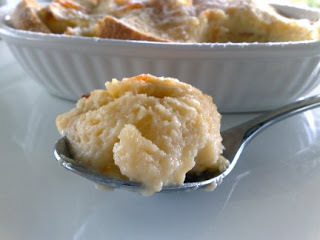 Layer into a greased ramekin or small baking dish. Make sure you leave lots of pointy edges facing up as these will get nice and crunchy. In a small bowl beat the egg, sugar and marmalade together and set aside. Place the milk into a small saucepan and bring to the simmer. Once the milk is hot pour over the egg mixture, beating constantly to ensure there are no lumps. Pour the milk and egg mix over the bread and let sit for about 15 minutes to absorb. This will make the pudding lighter and not stodgy. Place the ramekin into a larger baking dish and pour enough hot water to come half way up the sides of the ramekin. Bake for approx 20 minutes or until the top is crunchy and golden and the pudding feels set. Allow to cool for a few minutes before digging in. It will firm up as it cools. Delicious! 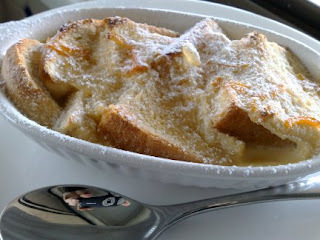 You mean to tell me I can have bread pudding for lunch?!?! OMG, I love that stuff and yours looks so delish! Must try this, like today. Thanks for the recipe. Hi, I just found your blog and I love your food. 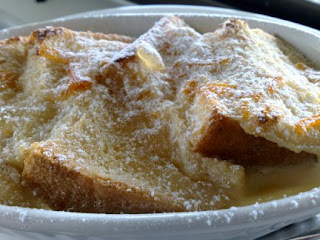 This bread and butter pudding looks great, and what a nice treat for when you're eating alone! Yay, a recipe for one!! I like it. I often resort to the baked beans on toast thing, so I know exactly what you mean. Mmmm I just tried this and it was oh so delish! I added in a couple of choc chips and some cinammon on top too. Thanks for the recipe!